Sarah Nader- snader@shawmedia.com Chip Madjak (left) and Ron Vermillion with the Crystal Lake Park District, line out all the buoys from the swimming area at Main Beach in Crystal Lake Tuesday, September 8, 2015. After the buoys dry they will be stored till the beach opens back up Memorial Day weekend. 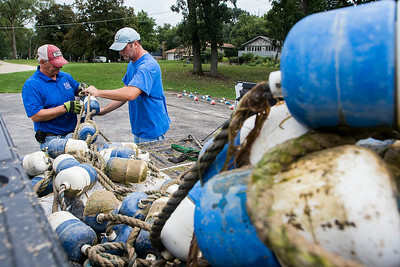 Sarah Nader- snader@shawmedia.com Ron Vermillion (left) and Chip Madjak with the Crystal Lake Park District, line out all the buoys from the swimming area at Main Beach in Crystal Lake Tuesday, September 8, 2015. After the buoys dry they will be stored till the beach opens back up Memorial Day weekend. 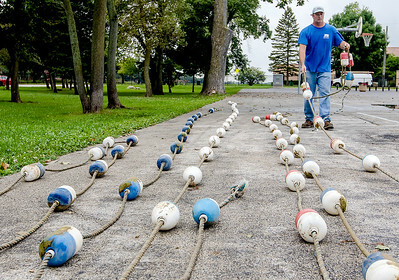 Sarah Nader- snader@shawmedia.com Chip Madjak with the Crystal Lake Park District, lines out all the buoys from the swimming area at Main Beach in Crystal Lake Tuesday, September 8, 2015. After the buoys dry they will be stored till the beach opens back up Memorial Day weekend. 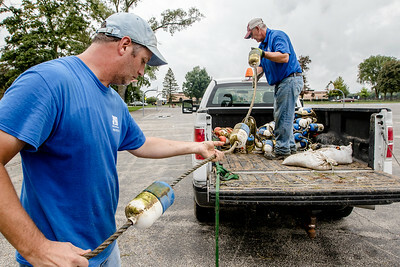 Chip Madjak (left) and Ron Vermillion with the Crystal Lake Park District, line out all the buoys from the swimming area at Main Beach in Crystal Lake Tuesday, September 8, 2015. After the buoys dry they will be stored till the beach opens back up Memorial Day weekend.